Kids have stressful days just like adults. 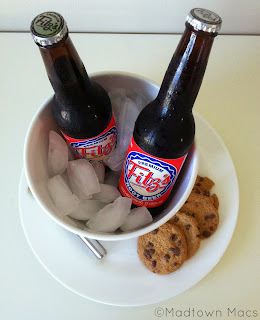 After a stressful week I treated the kids to root beer and cookies after school on Friday. It was a good start to a great weekend. Hope you had a good one too. We closed the door to the seasons of both baseball teams on Saturday. Vance loves playing but I think we're all ready for a break from the practice schedule. This frees up two nights a week for us! Guess who's eating a real dinner tonight? Us! Vance also had soccer this weekend. It was a good game and the boys scored the tying goal with a penalty kick at the last second. So much fun to watch! We visited with friends at our town's local BBQ competition which was a lot of fun despite a little rain. My mom surprised the kids with the bracelet maker that they've talking non-stop about. I took the "teach a man how to fish" approach and made the kids learn how to do it. (I had to watch a child explain it on You Tube to learn.) Once I knew I taught them and surprisingly Vaughn can even make the basic type on her own. Vance has taken off and has learned how to do some of the tricker styles. Rubber bands are everywhere but I love that they're working with their hands! Glad they are busy making bracelets...Jack can't get enough of them! Enjoy your down time from sports...I'm counting down the days until football is over. But there's still a lot of day ;( Have a great week! Delphi, it's the Fun Loom or the Rainbow Bracelet maker - there's a couple different brands out there. It's basically woven rubber bands. Google it and you'll find a ton of info and pictures! The kids love it!